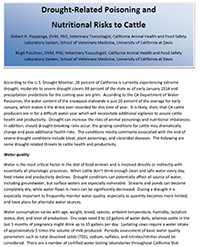 Drought can increase the risks of animal poisonings and nutritional imbalances, and the onset of drought‐breaking rains can dramatically alter grazing conditions, posing additional health risks to cattle. Drought leads to predictable lack of forage production on rangelands. 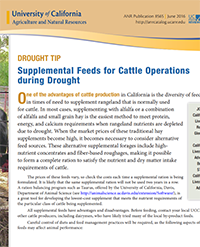 This publication is designed to help producers think through the supplementation of cattle during drought years. 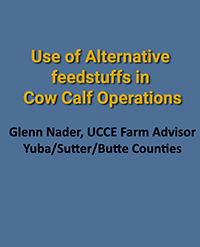 Overview of alternative feedstuffs available to California livestock producers, including nutrient information, costs and considerations for managers. More information is available in this presentation! 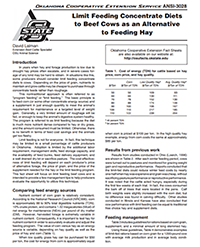 In years when hay and forage production is low due to drought, limit feeding concentrate rations may be an option for some producers to reduce feed costs while maintaining nutritional requirements of cattle. 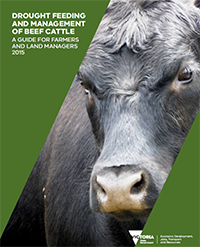 Guidelines to assist beef producers in reducing drought-related costs and impacts by managing for the planning, feeding and recovery periods of a drought. 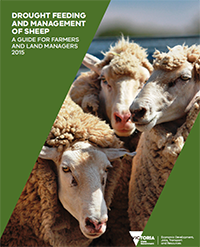 General recommendations for developing a plan to manage conservation challenges, animal feed requirements, feeding in confined areas and assessing water reserves and quality in drought conditions. 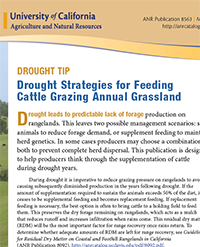 A guide to using alternative supplemental forages to augment rangeland forage during drought.